Since 2012, Steam Greenlight has served as a kind of Kickstarter-for-indie-games, giving anyone the chance to get their title in front of a mass audience. The best games with the most support could earn an entry in the official Steam Library. Now Greenlight is going away, as Polygon reports: the service is going to be shuttered before the middle of the year. 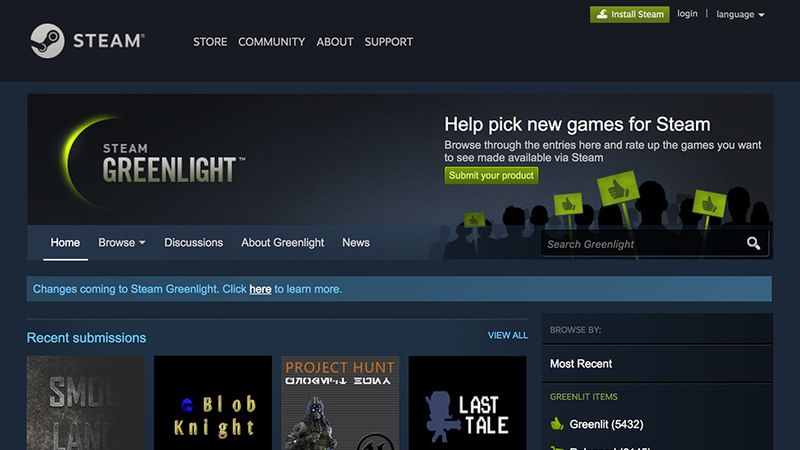 It’s not a complete surprise, and Steam executives have always hinted that Greenlight was only a temporary solution. That doesn’t mean smaller publishers are going to get shut out completely, though – a new service called Steam Direct will take its place, with the popularity contest aspect axed and replaced with a simple submission and payment process. The fee for getting a game live on Steam Direct is yet to be finalized, but it’s likely to be higher than the $100 it costs to be a part of Steam Greenlight. The idea is to keep the market open to everyone while discouraging a flood of lower-quality titles. With thousands of games published through Steam every year, Greenlight was designed as a way to ease the burden on Valve staff, who would otherwise have to assess every submitted title. The problem is the replacement system has now become rather uncertain and confusing for developers. Steam Direct should streamline the process and hopefully give more independent publishers a way to reach gamers. However, we’ll have to wait and hear more details before we can really assess how significant the change will be – you can read the official announcement here. Next › Tesla plant unionizing effort gains momentum in Calif.